The downfall of my attempt to make Lemon Blueberry Cheesecake Cookies? Frozen blueberries. And when I say downfall, I don’t mean that they were inedible. 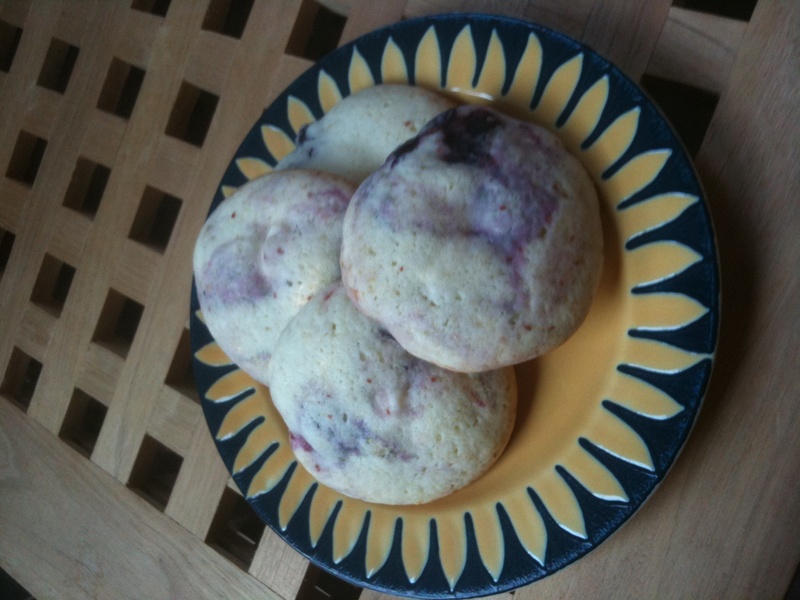 On the contrary, they were delicious, with a cake-like consistency that made them very much like tiny, round blueberry muffins. The recipe didn’t specify whether to use fresh or frozen blueberries, but I’m pretty sure fresh blueberries would have held up better. I added the blueberries while they were still frozen, so they held up well during the mixing process. No matter how careful I was when I rolled the dough into balls, however, I inevitably broke a blueberry, resulting in a slippery, slimy ball of dough. Next time, I think I’ll leave the blueberries out of the dough entirely, and then mash a couple of frozen blueberries into each ball of dough before baking. Mushy problem solved. I had the exact same problem with mine. They are in the oven now. I thought next time about just mashing them as well! Strawberries would be good, and hopefully not as mushy.